Did I leave you on a cliff hanger again? I’m really sorry for that, but where were we… aah! Yes, I wasn’t able to get through since my Scott Bike did not get a permit. Turns out there is no permit required for a bicycle. I know right, damn-it, I was pretty angry but somehow I managed to control all that for the road in front of me wasn’t the same, the other side of the fence seemed greener (not sarcastically, I swear), shiny black tarmac roads. The area was much cleaner too and it seemed as if the border had changed a lot more than just the country. By noon, I was back on the Scott and cycled for the complete day stopping for photos mostly, there was not much to eat there except for a lot of pan shops (people in Bhutan seem to be addicted to pan). Also when it got late I couldn’t find any houses or dhabas to stay and so I decided to spend the night in jungle. I cycled enough to find myself an open spot and I slept there with only my sleeping bag (I choose to carry this wildcraft sleeping bag with me since it could bear temperatures as low as -7°c, but even this did not seem enough, since the night was pretty ruthless). It was very cold and I was very scared but I woke up alright (Ironically I dreamt of all the things that could kill me). I started cycling again in the morning at 6AM and reached Thimphu by 9PM. My first concern was to find a proper stay for myself. I contacted all the numbers that I had but unfortunately, they seemed to be of not much use. So I booked myself into a hotel. Bhutan is a very cold at this part of the year, it was pretty difficult to get out of the room. But there is one thing for certain, the place is very beautiful and has been gifted very uniquely by the maker of the universe. It almost feels as if you are inside one of those wallpapers of the computer. The complete place is quite hilly and chilly at the same time. But the fun part is once you buy the local sim, you will get network coverage even in the most unexpected places. (Buildings, underground, roads, jungles, everywhereee). The next day was a dull Sunday morning. I decided to go to the nearby clock tower for a stroll. I happened to meet Thinlay Wangchuk, I had seen him cycling the other day (I tend to develop an instant connection with people). He took me to a lot of good places, had a nice chat with him and realized that he was a tourist guide. We then went to a couple of places together including a monastery and the Buddha point. 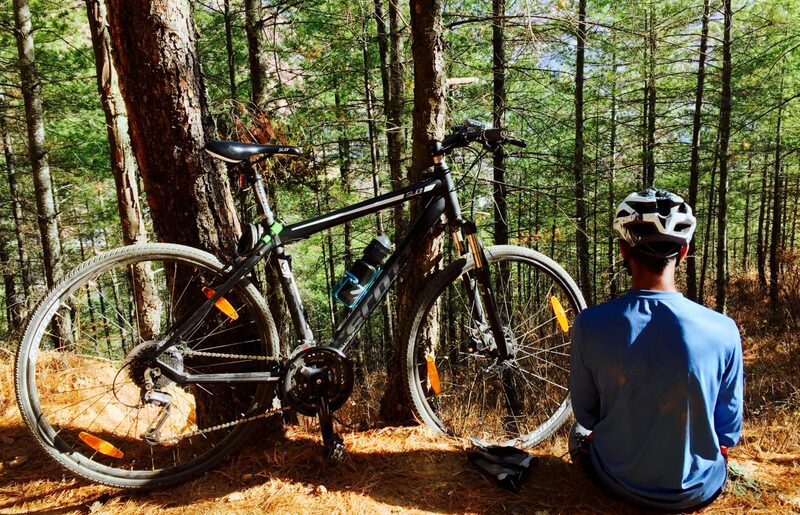 When I was cycling through the roads of Bhutan, I felt an eccentric calmness rush through me. For I do not possess enough words to describe what I saw there nor the necessary lens to capture it and show it to you people, but it’s all here. Right in my head, and I relive it again and again. You will realise one major difference when you come here that is, the people become really friendly in this part of the world. They tend to live a satisfied life even though things are pretty expensive here, They are calm and happy, unlike people I’ve been with. And why wouldn’t they be, they see these eye-candy sceneries on a daily basis, and live their life peacefully. After my leisure time was over, I began meeting different organizations like BOIC, BOAWE, Loden Foundation, My Bhutan. My aim with “The Bhutan Project – Scott Ride” was to collaborate with these organizations and influence the right crowd to increase the popularity of entrepreneurship in the nation. I happen to be a motivational speaker and various big institutes and thus I knew the perfect way to encouraging people was to set an example for the rest. For that reason I had selected a local business that wasn’t running so well). I spend that night at Thinlay’s place and the next at my friend Nima’s office where I broke a lot of things unintentionally, still sorry for those. She handled the situation very well, (I told you the people here were very calm, but this calm was woaahhhh!!!). So eventually, the money that I had taken from Gaurav dried out compensating for my hotel rents, phone bills and food and so I called Gaurav again and asked him to share his bank account details so that my mom could transfer some amount in his name and I could withdraw it from here. He asked me to come to his office and told me that we will figure out something. While I was on the way, going to Gaurav’s office, I decided to go hitchhiking. On my signal, when a car stopped, the person asked me to where I was heading. And then he later dropped me to my destination and then waited for me to come back and then leave me where I wanted to go. I was mesmerized by his hospitality and his kindness. Then at last I met Chimmi Dorji, a local entrepreneur- Fly to Bhutan (This was the business that I had selected), who had been struggling a lot lately. He was actually the boss of Thinlay and we went to meet him in Paro. He had tried many businesses but somehow he was unable to cope up well and so needed help. I was really glad to meet a person with the right amount of potential so I was very happy that I finally had an enterprise that I could help in Bhutan. I took up his case and am currently helping in reshape his brand to “Bhutan Check-In“. The biggest point was that he did not possess the right approach towards customers, and so I decided to begin from there. On 31st morning 6:00 a.m., I woke up at Thinlay’s place again and got ready to ride my Scott back to India. 7:00 a.m. I was all set to start moving. We bid our farewells to each other. And then I started riding Scott from thimphu to Phuntsholing, Bhutan. At around 3:00 a.m. I started hearing sounds of branches twitching somewhere nearby, all the sleep ran away as I sat upright looking for the source of the sound. Keep posted to hear the rest of the story!